Top Fill Poultry Fountain Size: 5 Gallon | Fountain City Art Ctr. 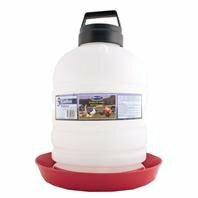 Top Fill Poultry Fountain Size: 5 Gallon by Millside Industries at Fountain City Art Ctr.. SKU: 064021. MPN: P5G04. Hurry! Limited time offer. Offer valid only while supplies last. P5G04 Size: 5 Gallon Features: -Poultry fountain. -Rust proof, dent proof and easy to fill. -Polyethylene water jug snaps easily into the base. P5G04 Size: 5 Gallon Features: -Poultry fountain. -Rust proof, dent proof and easy to fill. -Polyethylene water jug snaps easily into the base. -Vacuum sealed cap controls the automatic water flow. -Sturdy construction and a rugged handle ensures long lasting performance. Product Type: -Feeders & Waterers. Color: -Red, White. If you have any questions about this product by Millside Industries, contact us by completing and submitting the form below. If you are looking for a specif part number, please include it with your message.